Two things on our “to-do list” before any trip include sketching out a vague itinerary of what we want to see and do and researching restaurants we might enjoy. Since the food angle is always high on our list of priorities, the problem then becomes: “How do we find places we’d like in big cities?” By and large in Manhattan, we’ve had good luck exploring the online editions of New York Magazine. Such was the case this past summer when we found an article about Artisanal, which adds the delectable subtitle to its name: Fromagerie, Bistro, Wine Bar. Even though the magazine’s critics were stingy in their two-star (out of five) rating, the idea of the restaurant’s “boutique cheese cave” was all the hook we needed to give it a try. 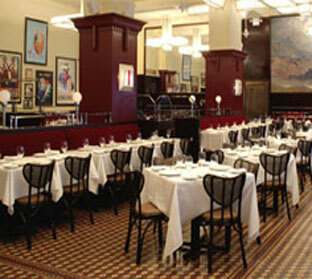 Besides, its location at 2 Park Avenue was just a short walk from our hotel in Murray Hill. 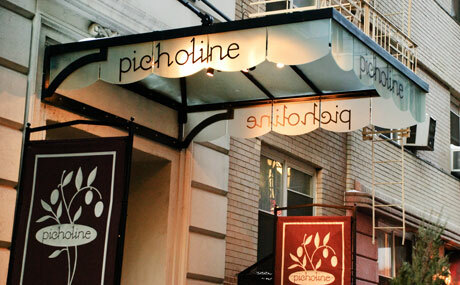 Usually the word bistro conjures up the idea of a small, cozy French café. The sight of this 160-seat restaurant was a bit off-putting at first, as was the size of the huge menu. Other details, however, like the white tablecloths, the black-suited waiters, and the checked floor really felt right, so we decided to go in. I had the Friday night special, bouillabaisse; for about $30 I got a lovely saffron-infused soup filled with shrimp, cod, mussels, scallops, and lobster. My husband decided on the $38.50 prix fixe which allowed a choice from four appetizers, four main dishes, and four desserts. His slice of country pâté was large enough for two and delicious. The strange-sounding but quite good chicken under a brick was crispy and served with a nice sauce and vegetables. He chose the cheese platter instead of dessert which required an extra five dollars; for the quality of the cheese he got, it was really worth it! Some reviewers have said that the fare at Artisanal is inconsistent, but that night we were not at all disappointed in the food, the wine, or the service. The two young women seated near us also appreciated their meals, one of which was the cheese plate. Worth remembering! There were many other items on the menu, like the gougères, escargots, French onion soup, and hanger steak that I’d like to try on a future visit. Chef and proprietor Terrance Brennan was trained at some of the most famous restaurants in the U.S. and Europe, such as Taillevent and Le Tour d’Argent in Paris. He had the unique idea to incorporate cheese into his menu as you would find just about everywhere in France. His “cheese cave” has a prominent spot at the rear of the dining room at Artisanal. 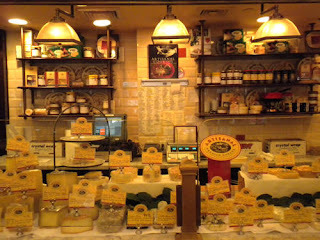 Diners are encouraged to have a sample--a difficult choice since there are over two hundred cheeses in the case. 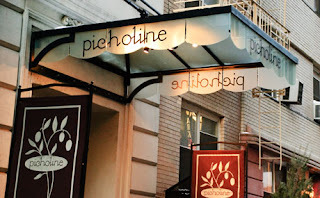 Brennan’s first foray into the restaurant business came in 1993 on the city’s Upper West Side with Picholine, which quickly won stars from the New York Times, Zagat, and Michelin. The upscale venue (whose name refers to the small green Mediterranean olives) is conveniently situated across from Lincoln Center. But the current $92 price tag for a three-course dinner will undoubtedly keep us Cheapos away! A third location at 268 Broadway, Bar Artisanal, has apparently closed its doors, though it might just be temporarily. Its two- and three-course meals at $21 and $28 sounded way more promising. Anyway, if you like French cuisine and especially cheese, we'd suggest trying Artisanal.